A drill press was originally designed to assist in metalworking trades. However, it has evolved in terms of its functionality for becoming one of the most sought after tools of modern day shops. Apart from drilling metal, it can also assist with piercing into wood as well as taking up woodworking operations like sanding and mortising. Today we are going to take a look at five best drill presses which can assist you with metal work as well as things to consider while purchasing the same. An inaccurate drill press cannot be of any help as it needs to be held on with precision for coming up with results which are similar to a factory assembly line. The top rotational speed of the drill is used as an yardstick for judging its prowess. The variable speed ranges can vary from one to five with each offering greater versatility than another. 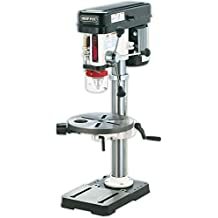 Portability and stability of the drill press is influenced to a large extent by its weight as a heavier unit will vibrate less to usher in greater precision to your work. Greater power requirement is felt if you wish to bore a longer or wider hole through thicker metals like steel or iron. The stress level of drill bit will get substantially reduced coupled with increasing horsepower. You can take your pick between a bench top or floor model wherein the first one is perfect for taking up smaller tasks requiring less precision and the latter is ideal for larger scale projects requiring greater accuracy level. This is the gadget which can guarantee that you make openings having equal depth level. This feature becomes an absolute must while boring a considerable number of holes wherein each of them needs to be of similar depth. 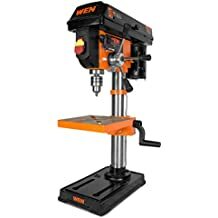 The WEN 4214 drill press is more of a woodworking tool which can cater to the requirements of woodworkers, mechanics, hobbyists, metalworkers and construction workers in a seamless fashion. If you are looking out for a solution to assist you with the creation of furniture having evenly pressed holes, then this dynamic drill can serve as your best choice. You can take your pick between varying speed levels ranging from 580-3200 RPM depending upon the type of material you are dealing with. This feature can assist you in carrying out your work without destroying the cleanness of the resulting hole or cracking the stock. You can clearly estimate the level of depth adjustment coupled with its accompanying gauge wherein spindle travel can be limited with the knobs for ensuring optimum precision while carrying out automated and repetitive drilling. 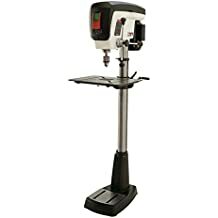 The solid built of this drill press can assist it in standing the test of time whereas the accompanying warranty of 2 years further adds to your peace of mind. You can aim the drill with complete accuracy thanks to its laser guide which can be of tremendous assistance while you try to make a hole. Another feature which deserves special mention is its LED on-board work light which can assist while working with irregular pieces which have a tendency of obscuring your view by casting shadows. You can also keep track of your drilling speed coupled with the LED screen which helps tremendously while making an adjustment. Offers infinitely variable speed levels ranging from 580-3200 RPMs. Equal torque is delivered throughout the range by the mechanical variable speed. Accompanied with table roller extension, laser, 5/8” keyed chuck and key. Rack and pinion height of the cast iron worktable can be adjusted. You can gain clear understanding of the drill press speed from its LED screen display. Table roller can be extended up to 17 inches for imparting adequate support to your workpiece. Becomes difficult to tighten the chuck as the key comes with a little spring loaded pin at the end. The high performing 3/4 hp motor renders superb power to the Shop Fox W1668 drill press for assisting you in performing an array of tasks with equal brilliance. The metal heat dissipators of the engine makes it perfect for heavy-duty drilling which is definitely going to please all drilling enthusiasts. You can handle a plethora of jobs in a seamless manner coupled with its ¾-inch drilling capacity. The table can be tilted up to 90-degrees on both sides and its height can be adjusted for working with special sanding angles. Heat build-up gets reduced by oscillation so that you can benefit out of a smooth finish while sanding. The 5/8” chuck powered by the motor bears an excellent construction quality and can work with different drill bits thus adding to the model’s versatility and flexibility. You can carry out efficient contour sanding coupled with this 12-speed drill press which can also double up as an oscillatingsander whenever required. The clearance hole of the table can be used while sanding without clearing a mess courtesy the clever implementation of its dust collection port. Well-built drill press which can easily withstand harsh working conditions. Can be used at 12 different speed levels for greater versatility. Drill press can be changed to an oscillating tool by pressing a simple button. Table can be tilted up to 90-degrees on both sides for greater versatility. The accompanying table can be moved out of the way for using the drill press base as a table. Lacks a working light making it difficult to work in low-light scenarios. Difficult to assemble given the complex manual info and lack of labels on parts. If you are handicapped by limited shop space but still wish to bring home a large capacity model, then the WEN 4210 can serve as the ultimate answer to all your questions. Its top-notch features and stellar construction in spite of an affordable price frame has already made it a popular pick of drilling aficionados. You can choose your desired speed level ranging from 600 to 3100 RPM in accordance with your work requirements. It is recommended to opt for lower speed setting while dealing with hard materials with optimum accuracy whereas a high speed is required to perform quick drilling on softer materials. The spindle can travel up to 2 inches irrespective of the type of material used while the chuck imparts adequate flexibility to cater to different bits while drilling differently sized holes. Most of the drill press is crafted using cast iron which adds weight and stability to its operation. At the same time, it also reduces vibration so that you can benefit out of greater accuracy while using the tool. The precision laser specifies the exact spot from where the bit will travel to bring ahead utmost accuracy while drilling. Visibility at work area also gets accentuated by its built-in work light which ensures that you never miss the desired point. Accurate stock positioning gets guaranteed by its laser crosshair feature. Offers the supreme flexibility of adjusting between five speed levels. Ample torque and power provided by its durable 3.2-amp motor. Sturdy cast iron base prevents wobbling and walking while working with bolt holes. Emits a low humming sound which comes as a breather in comparison to its noisy peers. Is accompanied with red safety glasses. Capacity is insufficient to take on professional or commercial tasks. You might be required to loosen a few bolts for tilting the table. Spring-loaded pin at the end of the chuck key makes it difficult to tighten the chuck. While dealing with metal if you ever need a drill press which can get all the tough work done without weighing down heavily on your wallet, then the SKIL 3320-01 can serve as your best choice. This nice little model by SKIL has already started garnering a heavy fan following amongst occasional drilling enthusiasts given the top-notch functionality offered under an affordable price tag. Its 10-inch swing helps in choosing between five different drill speeds to cater to your varying requirements with utmost precision. Whether you are handling thick metal drilling with high torque or going slow for precision drilling, the SKIL 3320-01 can assist you beautifully with the same. It is now possible to work even under low light circumstances coupled with the laser guidance feature of the SKIL 3320-01which can assist you with precision hole drilling. You can easily accommodate up to 45-degree angle cut with the depth adjustment system, cast iron base and powerful 3.2-amp motor of this efficient drill press. Weighing at just 55 pounds, this portable drill can be carried around to the work truck if you wish to carry out precision drilling at numerous job sites. The solidly built SKIL drill press comes with a year’s warranty to keep you buffered from technical glitches as well as 30-days no question asked money back guarantee. Larger pieces of material can be supported by its square work surface while its ½-inch keyed chuck makes cutting and woodworking easier by accepting larger bits. Precise hole alignment gets guaranteed by laser X2 2-beam. Work surface can be tilted both left and right up to 45 degrees. Accurate measurements are guaranteed in repetitive drilling by the adjustable depth stop. You can take your pick amongst five different speed levels for greater versatility. Excellent starter drill offering optimum value for money paid. Lacks in the department of precision when compared to its peers. Depth-stop feature is clumsy and confusing to set. 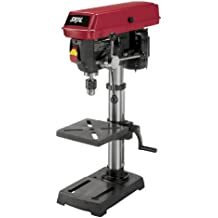 If you wish to carry out high-quality press which can punch its way right through all metals with absolute ease, then the JDP-17 3/4 hpdrill press by Jet can serve as your ideal bet. In spite of being a little on the costly side, it can blend the best of convenience and power for providing you with immense possibilities which you could only imagine. You can work with the JDP-17 3/4 hp on half-inch strips of steel metal and wood at various angles by toggling the speed level. You can drill one hole and drill again by adjusting the workpiece. It also retains its efficiency as you swap out differently sized wood bits and replace the same with metal ones. 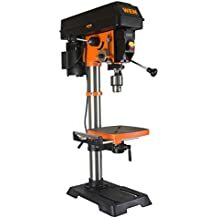 Unless you are a professional in the lookout for aircraft-level precision, this drill press can cater to your requirements in the best manner possible. And the best thing is that, it won’t dig a deep hole inside your wallet while showering you with greater possibilities. Some of the standout attributes of the JDP-17 3/4 hp are its large work table, integrated stop depth and provision for one-handed bit changes. You can benefit out of pinpoint accuracy coupled with the LED work light which assists in seeing pieces clearly. Rapid speed changes are allowed by its one-handed belt tensioning. It becomes quick and easy to carry out repetitive drilling by the integrated depth stop. Every single revolution of the handle makes the spindle travel up to a complete 5”. Large 14*19” work table helps in holding projects in the right place. Built-in LED provides direct lighting and reduces shadows. Can be assembled easily within just a matter of few minutes. Performance might decline rapidly while dealing with protracted metal drilling. At the end of the day, the drill press purchased by you needs to have a sturdy composition and effective features to stand the test of time while ushering in benefits. If you feel confused with the large array of options available in the market, then out list can help you in making the right choice.